Like Marygold, Petunia is located on the first floor of « La Petite Maison ». 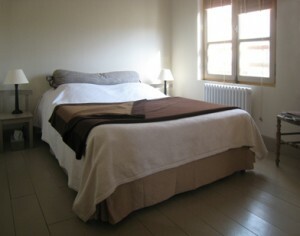 The bedroom is around 12 m2 with wooden florrs and private bathroom. The bathroom paved with tiny squares of mosaic has a shower, sink with mirror and a built-in toilet. The bedroom gets lots of light from a window overlooking a garden. Possibility of one king size bed or two twin size beds. Lights, materials, colors have been chosen to make you feel confortable in a relaxed atmosphere.